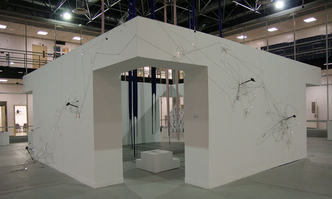 I am a multimedia artist working in installation and sculpture. 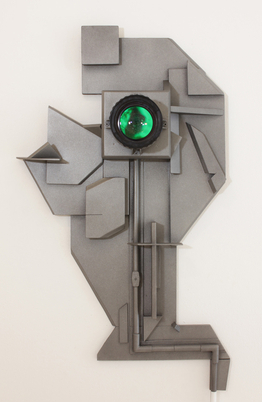 The process is of assemblage with a constructivist approach. I am attentive to the relationship between the macro and microcosm whether through immersive large scale works referencing matter floating in space, or interactive wall sculptures of various sizes that reference observational instruments. The installations take place mostly in spaces whose walls can be considered as large flat canvases. The materials used suggest scientific research and exploration. Tripods, lenses, telescopes, umbrellas, solar panels, and lighting equipment combined with traditional media such as wood, paper and paint comprise the foundation of the work. In these structures lights and cast shadow play with the tangible to create fictive pictorial spaces. Under certain conditions video projection adds to the visual vocabulary with moving forms that overlap the broken planes of the sculpture. 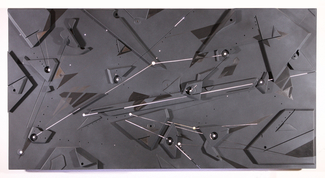 My ongoing studio practice is currently focused on the development of a series of smaller scale wall sculptures. In one series, Transportals", I appropriate lenses that give views into dotted worlds of layered materials. These objects function similarly to microscopes but open into expansive vistas. The three dimensional images inside the lenses can be construed as both macro and/or microscopic worlds. 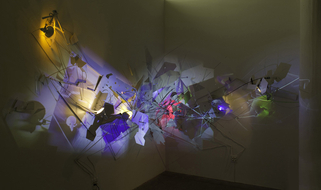 In a concomitant body of work, "Space Maps", a series of light boxes with perforated surfaces are activated by the viewer's movement in relationship to the work. These mostly horizontal pieces function as a kind of interactive star chart where lines and dots of light appear and disappear as the viewer moves across the work.